The easiest way to activate your software is to make sure that you have an active internet connection to the machine you want to wipe, and simply use the Cloud Account Code provided in your purchase e-mail to activate it. It is always best to avoid using a wireless connection, and instead use a physical cable connection to the internet when possible. If for any reason, you cannot connect to the internet from that computer, you can still activate your software using our Offline Cloud Activation system. You will need to be next to a different computer or device that can access the internet normally. Step 1) Once the software has loaded up, it will show an Activation screen. Enter your Cloud Code as shown in your e-mail, and click 'continue without activation'. Please Note: If you have a wired connection, you will want to select 'Cloud Activate' instead. Step 2) You should now see the Drive Selection Screen. Note that if you don't have an active internet connection, it will say "Uses Remain: Unknown" at the bottom. If you do have an active internet connection, it will show you your remaining licenses. Once you have the drive(s) you wish to wipe selected, go ahead and click the 'Next' button. Step 3) This next screen allows you to select your overwrite pattern. Select whichever pattern you prefer, then click 'Next' to proceed. Step 4) This next screen is a caution page. Please read through the information on this page carefully. If you do NOT want everything from your hard drive erased, you may need to look into other software titles we offer that are more selective in what they wipe. Click 'Wipe Now' if you are ready to proceed. Step 5) This next screen is a confirmation page. You must type "erase my data" to continue. 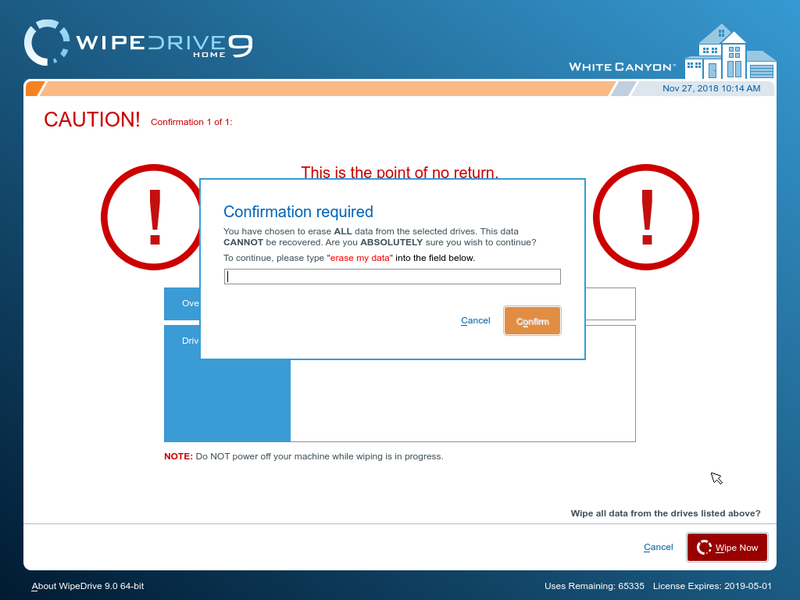 This is your final warning, and everything will be wiped from the selected drive(s) if you continue. Click 'Confirm' to proceed. 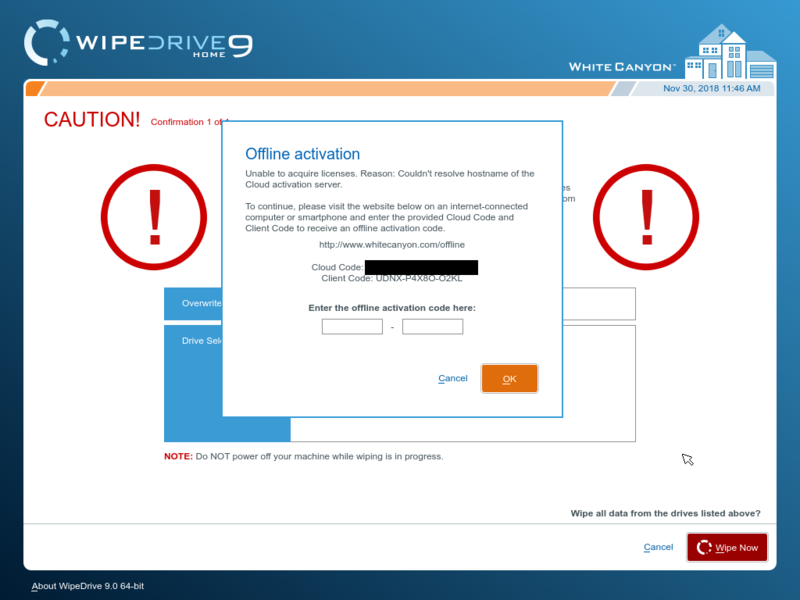 Step 6) Without an active internet connection, the software will fail to activate WipeDrive. This time, it will show you the Cloud Activation Code you entered previously, along with a new Client Code. This Client Code will change every time you run the software, so be careful with each code as you proceed. Step 7) The instructions on that screen will ask you to visit our Offline Activation page on a different computer or device with internet access where you can continue the process. 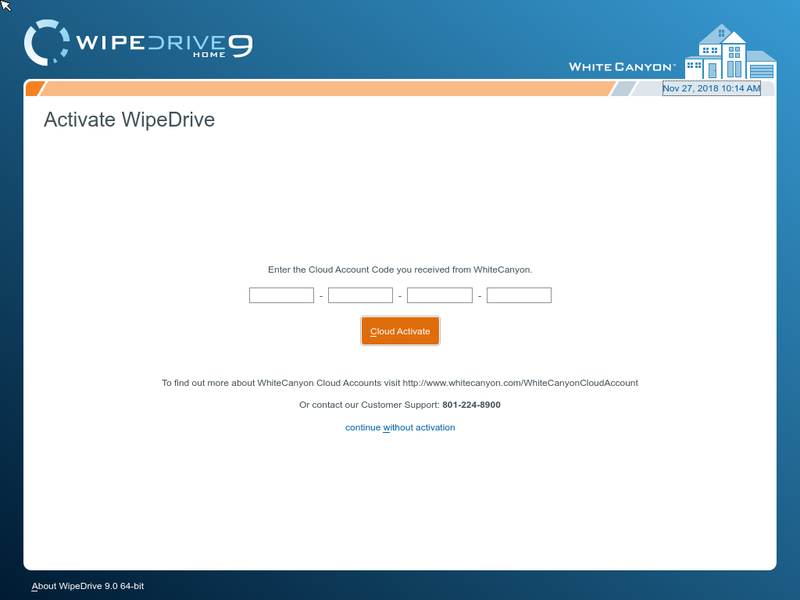 Fill in the Cloud Activation Code and Client Code that are shown in the WipeDrive message box, then click Submit. Step 8) After verifying with WhiteCanyon's servers, the page will proceed to show you a 10-character code separated into two fields. 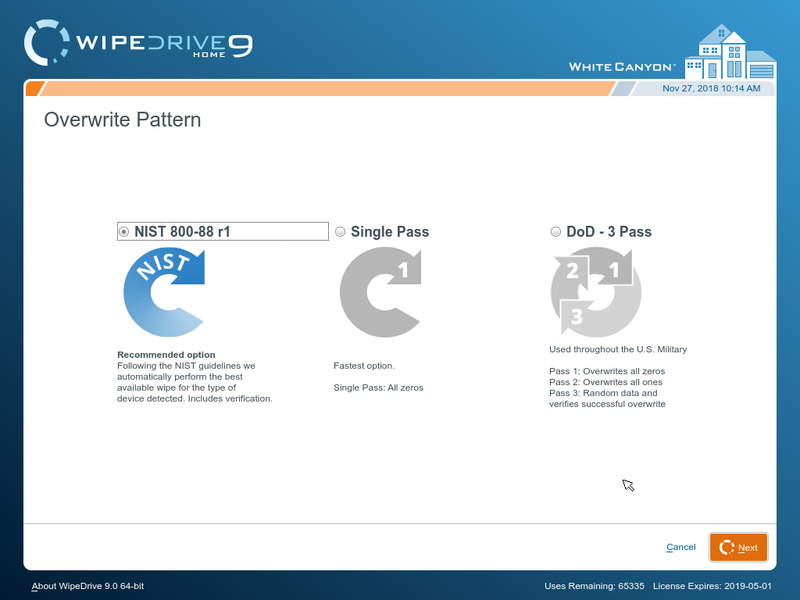 Place the new 10-character code into your WipeDrive software, then click OK to finish the activation process. 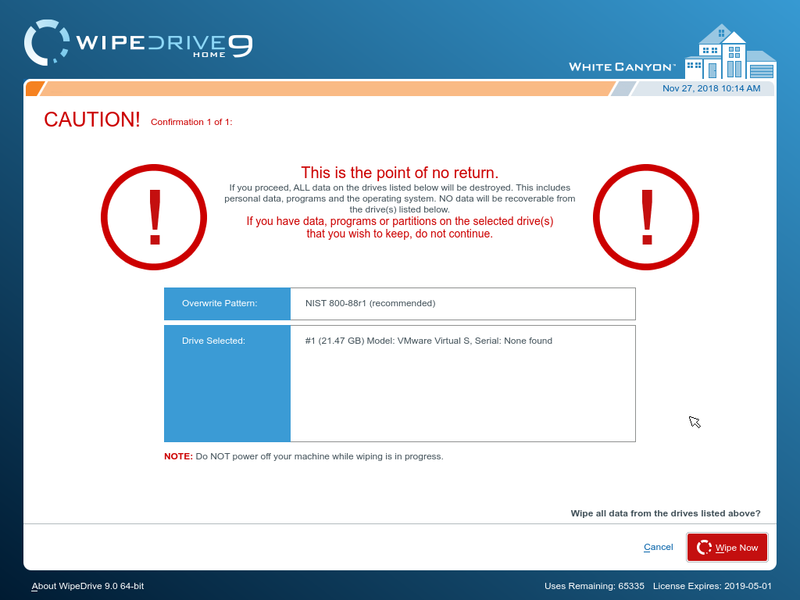 Step 9) You should now see the progress screen, and WipeDrive is securely erasing all contents of the drive. Step 10) When the process is finished, you will see a results screen like the one shown below. If the issue you're experiencing isn't listed here, please contact us at support@whitecanyon.com.